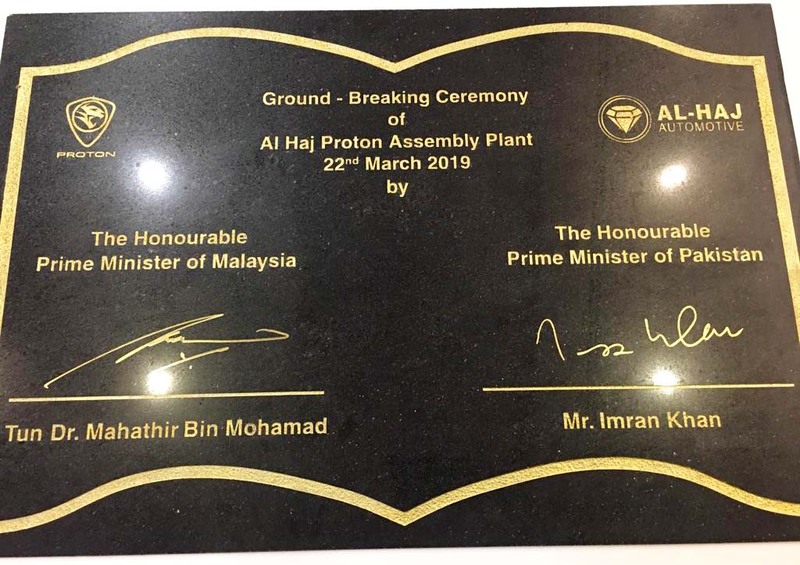 Islamabad, Pakistan, 22 March 2019 – A project for the first ever CKD assembly plant for Proton vehiclesin Pakistan officially began today when the Prime Minister of Malaysia, Yang AmatBerhormat Tun Dr Mahathir Mohamad and the Prime Minister of Pakistan, His Excellency Mr Imran Khan, signed a ceremonial marble plaque at an event held in Islamabad, Pakistan. The plant, to be built at a Greenfield site in Karachi, will be owned and operated by ALHAJ Automotive, the official distributor for Proton vehicles in Pakistan and is expected to commence operations before the end of 2020. In 2017, PROTON unveiled the seven stars strategy, a roadmap to achieve their long term goals including targeting to sell 400,000 units by 2027. A major future growth area for the Company is export sales and the establishment of CKD assembly plants in overseas markets is one of the steps taken to grow those numbers. “PROTON is very pleased its partnership with ALHAJ Automotive has moved forward very quickly since we inked the agreement in August 2018. Expanding the sales of Proton vehicles outside of Malaysia is vital for us to achieve our long term goals and we therefore hope for the Pakistan automotive market to be one of our growth engines for the future,” said Dato’ Sri Syed Faisal Albar, Chairman of PROTON. As an established distributor and assembler of vehicles, ALHAJ Automotive has the required experience and resources to manage and grow sales of Proton vehicles in their home country of Pakistan. The new CKD assembly plant, to be built in Karachi on a Greenfield site with an initial investment of USD30 million, will create 2,000 direct employment opportunities in its first three years of operations. It is estimated that a further 20,000 indirect jobs will also be created as a result of the new plant being commissioned. “ALHAJ Automotive is delighted to be the official distributor for PROTON in Pakistan. We will leverage on our current dealerships located nationwide to start selling Proton vehicles as soon as possible while we develop standalone 3S/4S outlets at the same time. Initially we will source CBU units from Malaysia before switching to CKD products once the new assembly plant begins operations before the end of 2020,” said Mr. Al-Haj Shah Jee Gul Afridi, Chairman of ALHAJ Automotive. PROTON Holdings Berhad is 50.1% owned by DRB-HICOM Berhad and 49.9% by Zhejiang Geely Holding Group Co. Ltd. Established in 1983, it is the only full-fledged OEM car manufacturer that is complete with research and development (R&D) facility in South-East Asia and was established with three primary national policy objectives, which are, to spearhead the development of component manufacturing industries, to acquire and upgrade technology and industrial skills within the automotive manufacturing industry and to strengthen the international competitiveness of Malaysia’s industrial capability. 1985 marked a momentous year in Malaysia’s history when the country’s first national car, the Proton Saga, rolled out for the masses. Since then, its offerings include versatile and reliable four-door family vehicles such as the Saga and Persona, stylish executive sedans such as Prevé, the elegant executive D-segment Perdana as well as spacious and affordable multi-purpose vehicles like the Exora and Ertiga. There is also the sleek sporty Suprima S that is packed with performance and the bold and stylish Iriz than emphasises safety and is the most affordable 5-Star ASEAN NCAP car. PROTON is more than just a car company as its inception as a key driver of national development has seen the brand accelerate its learning curve through technology transfer with strategic partnership and technical collaborations. There is no doubt that it has helped grow the Malaysian economy through its progress and success in the automobile industry. By listening to the needs of customers, PROTON cars are now steadily on track to achieve the mission for the future, with PROTON set to become a marque which builds quality and safe cars with passion and soul; cars that are enjoyable to drive – and a pleasure to own. For more information, visit http://www.proton.com. The very first of ‘ALHAJ’ company was launched in 1960 at Jumrud Khyber Agency in District Peshawar, KPK, with their initial businesses of import and export of electronic goods, textile and tyres. Later, the Company expanded its businesses in Oil Exploration & Al-Haj Foundry and entered into the Automobile business by acquiring dealerships of the leading automakers under the name of ALHAJ Automotive. Late Haji Sakhi Gul Afridi was the founder and first chairman of ALHAJ Group, a visionary person who had the ability to foresee the future and to turn prospective business into accomplished business goals. Under the leadership of Haji Shah Jee Gul, Chairman ALHAJ Group has embarked on a journey with a highly qualified and motivated core team, which has shown a strong focus on products, employee satisfaction and world-class customer service. The management has a vast experience of consistently introducing innovation and improvement in products to increase reliability. Next articleNo mass production of Suzuki Alto 660cc has been started yet in Pakistan!! !